Performance Reviewed was invited by Collide Theatre to attend their production of Tejas Verdes. 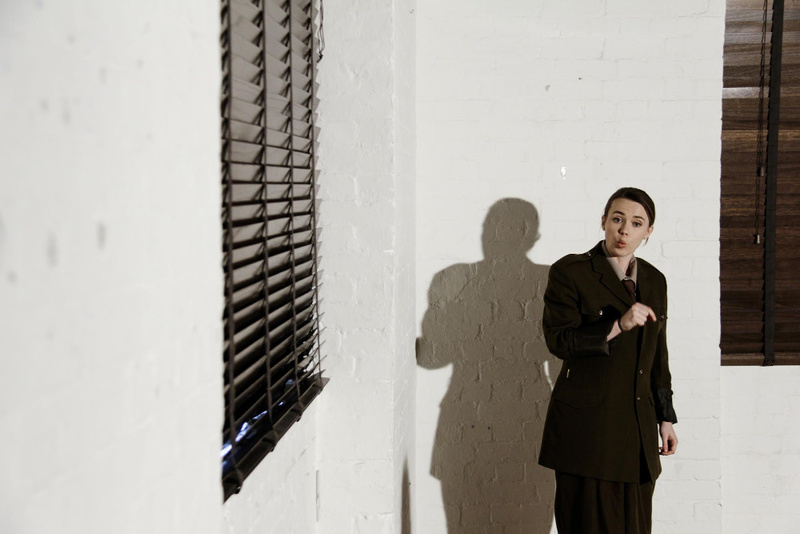 In collaboration with Ugly Duck, the performance took place at renovated Victorian warehouse 47/9 Tanner Street. 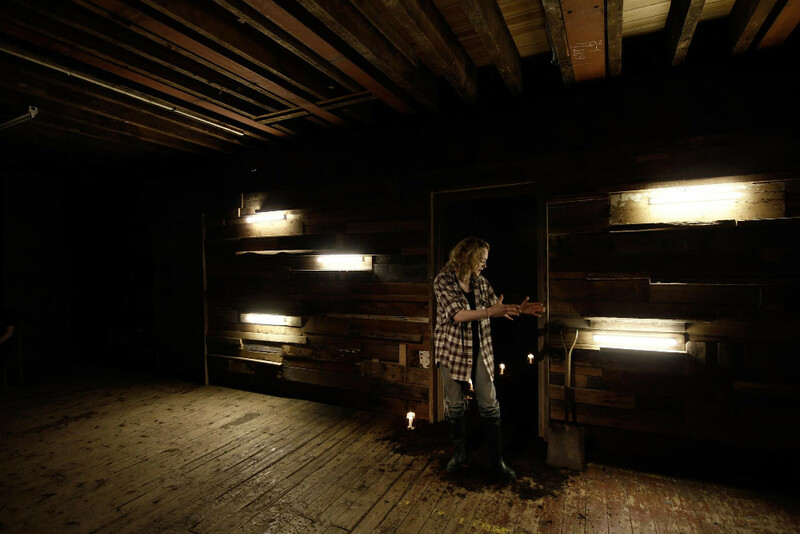 This was a site-specific promenade, with director Emily Louizou as the audience’s guide. (You can read our preceding interview with Emily here). Fermin Cabal’s Tejas Verdes is a story of Chile during the military junta, lead by Augusto Pinochet. During this period, over 3,000 Chileans were murdered, and many thousands more either imprisoned or exiled. Across seven monologues Cabal unveils the final days and disappearance of a young girl, Colorina, from the eponymous hotel turned detention centre Tejas Verdes. (A real location, it remains to this day as a memorial to its victims). The actual perpetrators are absent: instead five women, spanning social class and degrees of moral culpability, give us their perspectives. Roughly twenty people are ushered into the upper level of the warehouse, all wood and low ceilings. Once inside, the lights are switched off and, within the crowd, a girl’s voice begins a round of ‘Oranges and Lemons’. Ringing church bells will be a recurring motif. The actors, interspersed among the audience beforehand, were unavoidably recognisable. Yet as the chorus glides and weaves around us, the scene is still disorientating. We are in an eery vision of carefree girls playing hide and seek, and dancing, in the penumbra of statuary – or, considering the rhyme, of tombstones. Evocative moments like this are all Collide’s ingenuity, with their sparse, striking visual design. The space becomes Tejas Verdes itself, but only in fragments. Here a square patch of dirt, with an orange tree branch overhead; a chair and a solitary light-bulb there. Two side-rooms, half-wallpapered and conveniently seated, are the hotel interior. Each backdrop is temporarily illuminated when a character appears, seemingly out of thin air, for their monologue. Once completed, both vanish into darkness once more. One chooses where to stand or sit, and how close to the actors. There is a sense that we, the audience, are merely sliding into these moments, filling in one half of a conversation. It plays upon Cabal’s withholding of firm date or chronology. This is a series of exhumations out of time and place, suspended by words and memories. Or, in the words of Collide: “the time is the present – or even the future”. Throughout, David Denyer’s musical score instils a somatic dread. Uncanny textures, resembling human groans or whispers, and dissonant tones create a ghastly melody to the rhythm of Cabal’s text. Ava Pickett is Colorina, whose two monologues frame the play, and exactly captures the manner and speech of a late teenager/early adult. Colorina jumbles different times and places into one – and is unabashed about the torments and brutality of her captors. Looking at me, Pickett affects the guards’ taunting about her thin face and figure: I recoil from her vituperative glare. There is no adornment or exaggeration when she describes what they did to her body: the words are enough. Evelyn Lockley also has two monologues as the collaborator, and with her powerful performance becomes the heart of Tejas Verdes. It is jointly (see below) the most faceted, and certainly the most conflicted, of the characters. At first she seems merely envious and conniving, with a facade of wan humour. Her awful confession reveals a broken soul, deeply embittered at her own will to exist at all costs. Cabal wants the audience to feel a gamut of disgust, sympathy and pity, and Lockley deftly succeeds in doing so. Thoroughly unlikeable; totally compelling. In a much needed respite, Susan Hoffman is an amiable and poetic gravedigger. 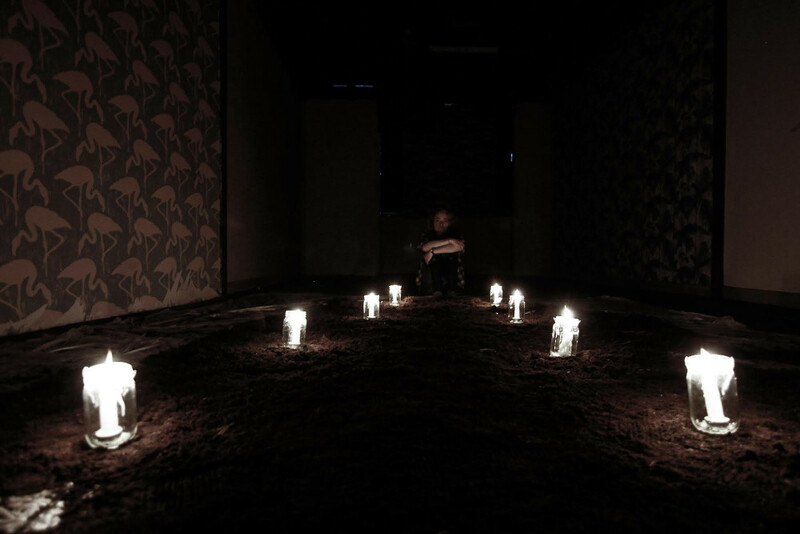 She stands in front of a shadowy room, empty save for candles ensconced upon the soil-laden floor. A mass grave for the dead of Tejas Verdes? Upon a macabre theme the gravedigger creates a living image of Chilean society, corrupted and rift apart by the violence. The monologue is Cabal’s most lyrical and Hoffman, poignant, morbid and genuinely funny, gives it an engaging and charismatic shine. Avoiding a procession of victims, to paraphrase Louizou, Cabal includes two willing members of the regime. 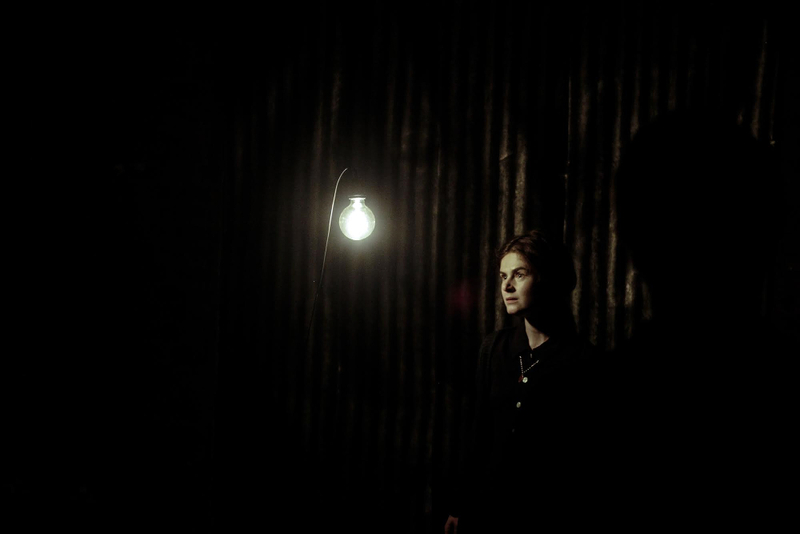 ‘Inside’ Tejas Verdes, the rooms filled with candid white light, we listen as they rewrite the narrative. Hayley Hirsch’s army doctor is a stereotype of the fanatical patriot, all dissembling and outrage in the face of a tribunal; but wholly convincing through a sheer bullishness. The lawyer, defending Pinochet to the press, feels like parody. Partly due to the fallacious and melodramatic rhetoric, partly Frances Keyton’s almost farcical villain. She swings between corporate façade and flustered indignation; it would seem insincere save for recent, surreal examples. Even the audience reaction, incredulous and guffawing, feels familiar. Both exhibit an almost devilish, knowing contempt towards their respective trials. The doctor recites a list of unbearably horrific torture methods as if she were an auctioneer. Take your pick, she suggests, of those to become a collective reality – and these to be buried and forgotten. In the end, Colorina curses Pinochet and the like to an oblivion of ‘roaring silence’, only able to comprehend the magnitude of their crimes. Completing her utterance, she leads the other women into the grave-site. All around there was a growing tumult of the crashing sea. Briefly it resolves into a mighty plunge beneath the waves – then nothing. I stand in the pitch black, waiting in silence for a sign or a cue. This is not just a spectacle of ghosts; it is also a moment when five women may speak defiantly into a multitudinous void, which is powerless to effect change and voiceless to protest. Perhaps the dictator and his instruments of terror had been present all along. Tejas Verdes is a meditation upon human commonality in suffering, and an indictment on the ease with which we erase and forget. In the words of Donne: “never send to know for whom the bell tolls; It tolls for thee.” As Colorina draws the distinction between hearing and listening, so Cabal indicts us of not truly listening – and therefore not truly understanding. Postscript: At the time of publication, I gave this production 4 stars – which jars somewhat with the glowing review. I’m not sure why I did so. It has been a couple weeks now, and I still think about ‘Tejas Verdes’. Moreover, there wasn’t anything I would consider a ‘negative star’. So I have revised my rating accordingly.